Epsom salt -- the same substance used to create a soak for sore feet -- helps you turn any window into a "frosted" window overnight, simply by brushing the glass with a super-saturated Epsom salt solution. The faux ice crystals last for up to three weeks even in warm weather, and they can be wiped away with ease. A simple, kid-friendly frosted-window paint begins with 1/2 cup of warm water in a clear glass container such as a measuring cup. Stir in 1/3 cup of Epsom salt, mixing until the salt no longer dissolves, to create a super-saturated solution. Mix in a drop or two of liquid dish soap. Epsom salt, also known as magnesium sulfate, forms crystals when the water it is mixed until it dissolves. To create a frosted-window effect, dip a microfiber cloth or terrycloth into either type of Epsom salt solution. Wipe down the window pane with the solution; then dab a dry paper towel over the wet window glass to absorb excess moisture. Allow the solution to dry completely, which may take at least a few hours. 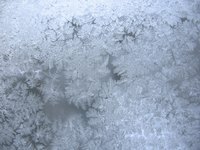 As the liquid evaporates, the magnesium sulfate reverts to a crystalline form that resembles ice crystals on the window. Once you're ready to see through the windows again, wipe the windows down with your favorite window cleaner, such as equal parts vinegar and water. Use a lint-free cloth to clean the windows. Sketch a design on paper, then recreate it on the window with acrylic craft paints for a washable window display.